$595. 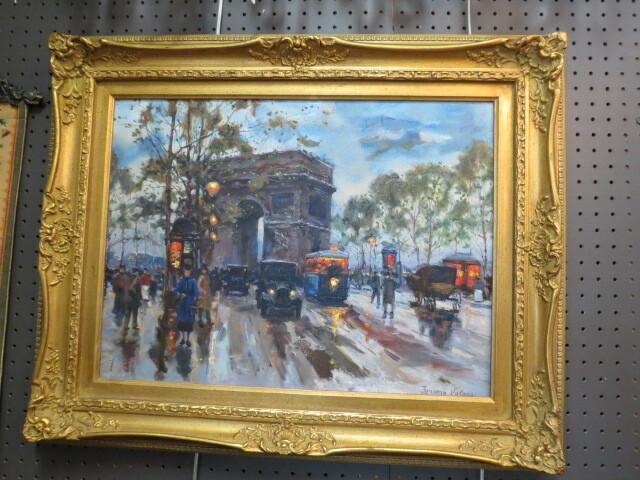 Vintage antique “The Triumph Arch” Paris impressionist street scene oil painting. 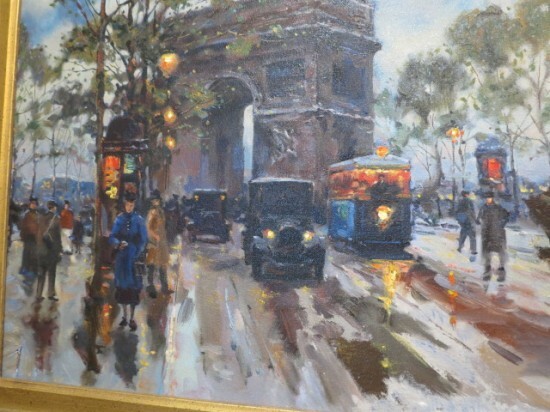 Beautiful oil painting on canvas of a twilight street scene of the Arc de Triumph featuring 1900s cars, streetcars and buggies with people walking. 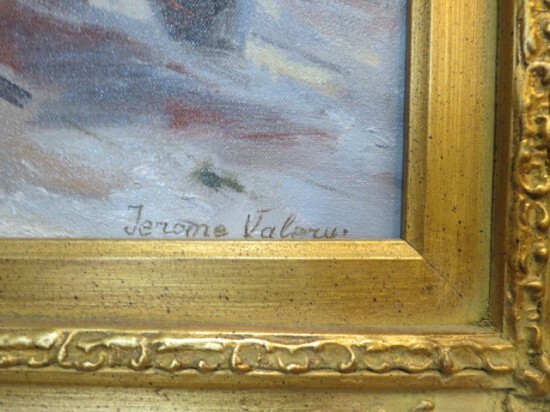 Signed Jerome Valery. Russian writing on verso. Colors are blue, gray, brown, green with touches of orange and yellow. 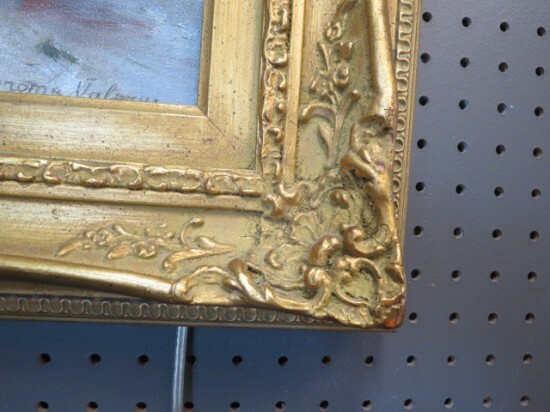 Gold ornate frame. Perfect for your living room. Excellent condition. 31.5in wide, 25in tall, 3in deep. Shipping not included in item cost. Local delivery available. Call Lincoln Antique Mall for more info 773-848-3070. 3115 W. Irving Park Rd. Open Monday-Saturday 11-7, Sunday 12-6. Visit us at lincolnantiquemall.com to see more great items! 7500 square feet of vintage and antiques! Voted Best Antique Store in Chicago. "One of the few true antique malls in town" -ZAGAT. Voted # 3 of the 10 Best Stores in Illinois by the Illinois Tourism Bureau! Like us on Facebook to see the newest arrivals. WE BUY vintage and antique furniture, chandeliers. Local delivery available. Call Lincoln Antique Mall for more info 773-848-3070. 3115 W. Irving Park Rd. Open Monday-Saturday 11-7, Sunday 12-6. Visit us at lincolnantiquemall.com to see more great items! 7500 square feet of vintage and antiques! Voted Best Antique Store in Chicago. 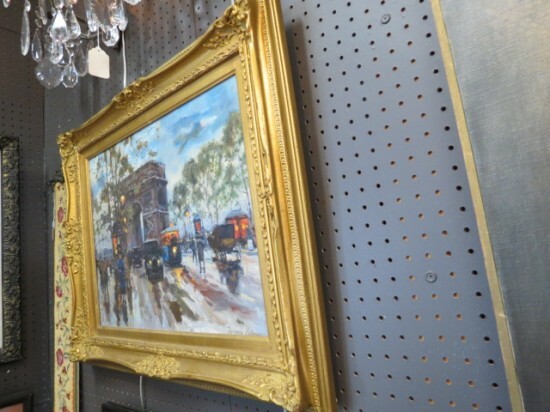 “One of the few true antique malls in town” -ZAGAT. Voted # 3 of the 10 Best Stores in Illinois by the Illinois Tourism Bureau! Like us on Facebook to see the newest arrivals. WE BUY vintage and antique furniture, chandeliers. A feed could not be found at http://www.facebook.com/feeds/page.php?id=6033808863&format=rss20. A feed with an invalid mime type may fall victim to this error, or SimplePie was unable to auto-discover it.. Use force_feed() if you are certain this URL is a real feed.